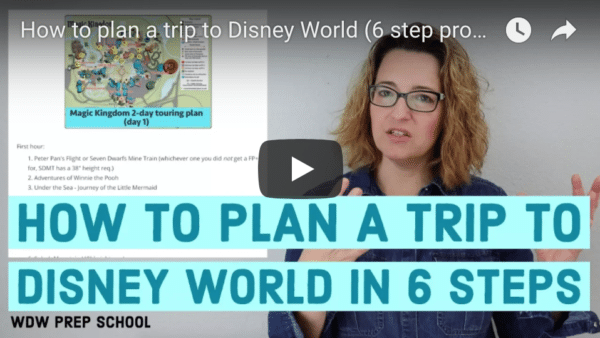 In order to do everything you want to do on your Disney World trip, you need to start planning more than 6 months in advance. 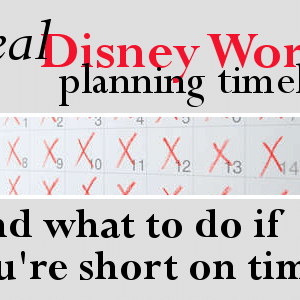 Of course, not everybody has that much notice on their trips, so they have to figure out how to plan on a shorter schedule. Here is the ideal planning timeline as well as what you can do if you are running short on time. What if you don't have 6 months? More than 6 months before your trip begins, you should have steps 1 (picking your dates) and 2 (choosing lodging) figured out. You need to make sure you're booked so that you can move on to the next steps. After your hotel is booked, move on to step 3 and make your daily plan. Figuring this out allows you to move on to planning your dining which is important to know before you get to the 180 day mark. At the 180 day mark, you need to move on to step 4 and make all of your dining and special event reservations. You can find the date that you can begin making dining reservations on the monthly calendars. If you're staying on-site, you will be allowed to make all of the dining reservations for your whole trip 180 days before your trip begins. If you're not staying on-site, you'll need to log on or call 180 days before each day of your trip to make those reservations. After your dining and event reservations are made, you should spend the remaining time before your trip on steps 5 (plan your park touring) and 6 (adding extra magic). When planning your park touring, be sure to stay aware of any park hour changes that could alter your plans. Confirm all of your reservations, make sure you have transportation figured out (including from airport to hotel) and pack your bags. I like to use the Ultimate Packing List to make sure I don't forget anything. When people have less than 6 months to plan, it always gives me a little bit of anxiety because they need to be willing to adjust their expectations. The first thing to know if you have less than 6 months to plan is that you need to work around what's still available. That means you might need to eat at odd times, make another restaurant choice and/or remove something from your wish list. The list posted above will be the hardest things to get for your trip, but here are some ideas for substitutions. Consider booking Princess Storybook Dining at Akershus in Epcot. This princess dining is on the list above as being popular, but is worth checking into as a possible second option. Check out Crystal Palace in Magic Kingdom. This character dining will be in high demand for breakfast before the park opens (the best time to go since you're not missing out on park touring time and can be in the park when it's empty), but you can be flexible on times and try to get in. ...then try to get a reservation for breakfast or lunch. Although it's a Quick Service for breakfast and lunch, Disney allows you to make reservations and they're usually much easier to get than dinner. Did you check to see if the Disney Springs location had openings instead of the Magic Kingdom location? Harmony Barbershop is located on Main Street in the Magic Kingdom and, although they don't do the fancy up-do hairstyles, they do use pixie dust and provide services at very affordable rates. The Pirates League is located in the Adventureland section of the Magic Kingdom. They offer pirate packages, but also a very pretty mermaid option. ...then dine with Mickey for breakfast at Tusker House in the Animal Kingdom. Word is getting out about this character dining meal so it is popular, but may still be easier to reserve than Chef Mickey's. ...check out the Pirates and Pals Fireworks Voyage which allows you to watch Wishes and the Electrical Water Pageant from the boat. Snacks and beverages are included. ...consider ordering private dining from The Grand Floridian. You will be provided a butler and a view of the fireworks for your meal, with dessert timed to arrive just in time for the fireworks. Dinner can be ordered from the private dining menu or for a 25% service fee, you can order from any of the menus of The Grand Floridian restaurants. Couples can expect to pay around $200 (plus tax and tip), depending on what is ordered. Private dining can be booked by calling (407) 824-2474 at least 7 days in advance. ...try eating at Trail's End at Ft. Wilderness and heading over to the Chip and Dale campfire afterward. ...then hop on over to the Grand Floridian where you can eat with Cinderella at 1900 Park Fare (Cinderella's Happily Ever After Dinner) or attend a Perfectly Princess Tea Party with Sleeping Beauty which includes tea for two and a doll for each girl. ...try Kona Cafe instead. The food and atmosphere are not the same, but they are both well-liked and located near each other inside the Polynesian Resort. ...try Yachtsman Steakhouse instead. Located just outside the International Gateway of Epcot at Yacht Club, it's not too far away from Le Cellier either. We are having lunch at Princess Storybook Dining at Akershus while we are there. Will the characters be there for lunch or only for dinner? Thanks! We are a bit behind schedule but seem to be having luck finding good times for reservations with characters. Only thing we couldn’t get is CRT, but if we can see Cinderella somewhere else, our 5 year old will be happy. Can’t wait to get to 60 days to start reserving FastPass things! Really hoping to get a meet and greet with Anna and Elsa. Your blog and advice are very helpful. We are going to WDW December 14. Today is my 180, and it 12:29 in the morning. Why can’t I make my reservations yet and what time can I start? I am really trying to get Cinderella’s Royal Table and Chef Mickey but I need some sleep. We are planning our first trip to WDW with 4 kids (one 3 1/2 yr old princess) We are past our 180 day ADR mark and I’m realizing what a big deal that is! Is there any chance of finding character dining reservations from now until our trip (Nov.22-27) Is it worth my time to keep checking back on the WDW website for any of the character dining meals? Keep trying closer to time! I just got a reservation for Chef Mickey’s 10 days out. I think I happened to check within minutes after somebody else cancelled. Apparently cancellations are highest in the week or two before the date. Good luck! If we are planning a trip for spring 2016 and plan to make the reservations over the phone spring or summer 2015 (our tentative 180 day mark was 11/11/15) … is it possible for us to make reservations at restaurants and such before the 180 day mark if we have made reservations at our Resort and have purchased our tickets? How early can you buy the park tickets? If I plan on going in February 2015, what is the earliest release dates for packages/pricing during this time? Will I be able to make vacation reservations in July/August? Would like to go to Disney world in late July with my six year old daughter. I thought three months was enough time to plan. I had no idea you could reserve 180 days ahead. Should i throw in the towel and just try for another time or keep going with my planning? Is the bippity boppity boutique in downtown disney just as good if the other one is booked? My family of 4 just went to WDW at the end of April and we didn’t decide until the end of January. It was a ton of planning but turned out fantastic. Is it possible to get a Fastpass for 2-3 different rides at one time? Right now you can get 3 fastpass for one day but the times cannot overlap (so not all at once, if you meant that literally). Once all three are used, they are working on adding an additional pass the same day. So my boyfriend and I just started planning a disney trip for end of may early june (I know super late). He wanted to surprise me with it but he didn’t realize it was a last minute thing and neither did I(he has never been to disney world only disneyland and I havent been to either) We will be reserving everything friday (when he gets his new debit card) and I was wondering if you had any tips for us, or a link wheere we can find some. We have three separate seven day time frames in mind and really want to stay in Port orleans riverside( with back ups in french quarter or coronado) and are only doing the quick service dining plan. Any other suggestions?THANKS! Feel free to email me with any specific questions but the only real advice I have for you right now is that you may end up planning around dining reservations a bit more than somebody who has more time to plan. There are still plenty of good restaurants available so that may not be the case necessarily but if there’s a high priority dining reservation that you want and it’s only available on a certain day of your trip at a certain time, your plans may just end up working around that. We just returned from our first (very short/quick) trip and I’d like to start planning for next year so money isn’t quite as tight. However, when I go to the Disney website the date planning only goes through the end of 2013. If you are planning 6 months in advance how do you do that and make a realistic budget? 2014 packages will be available online starting Wednesday, July 10. Room-only reservations can be made up to 500 days in advance by calling or using a Disney agent. Hi! I’m loving your site, thanks for all the helpfull information you provide. I’m planning a trip for either the second week of december or the second week of january. Do you think I’ll need to make dinning reservations even if I decide to go in january? I’m not planning on going to any carachter dining as I’m not traveling with children and have experienced Cinderella’s Royal Table and the Cristal Palace on my first trip. I just think I’d like the option of choosing whatever I’m in the mood for on any given day. I just got back from a trip where we ate in 4 restaurants. I had 3 of the reservations made ahead of time and then we decided on the 4th while we were there. I’d say if you don’t want to eat at any of the hard-to-get restaurants listed in this post, you’ll probably be OK. I found the easiest thing to do was to have the Disney World app on my phone and just make reservations right from there. My sister went in early December and did not make many ADR (if any) she wanted to do what she felt like and/or is not a big planner. She regretted it, as they were not able to get into a lot of places. I would recommend at least picking on place each day for ADRs or you might get stuck eating places that are not what you are in the mood for that day because you cant get in. I think if you have places you want to try get an ADR otherwise you might not get in. I have seen others suggest looking at what restaurants have opening today to see what are the less busy places. If you like those options you might be ok. Also note if free dining is offered your choices will be even fewer. Love your site! Great recommendations. We are currently planning our trip for September 2013. We’ve got our dining and room booked, now it’s just fine tuning! TP often/usually changes their recommendations as dates approach and they are also often very, very wrong. President’s Day Weekend, for instance, was insanely crowded and TP recommended MK on a Saturday and it had some of the longest lines I’ve ever seen. It was a ridiculous recommendation on their part. Shannon, how do you think it compares to Tour Guide Mike. I used TGM on our last trip (2010), and felt it was very accurate. I noticed on one of your other video posts that you mentioned he was out of date. I was considering renewing, but am reconsidering based on your comments. Hello 🙂 Great site, it has been so helpful to me. I have started planning my trip to WDW for the end of October 2013, and my question is since I am doing my itin now so I am able to be at a specific park on the day I have reservation at a restaurant we have chosen, how do I get around the extra magic hours? I dont want to be in the park that has the EMH, but since it is ever changing how can I plan for that 7 months in advance? I have signed up at touringplans.com and they give an educated guess on which days EMH will be in each park, but its not set in stone. So I am stuck on what to do. Any advice you could give would be amazing.